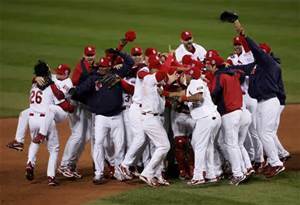 For the first time since 2011 when the Phillies won 102 games, the St. Louis Cardinals reached the 100-win mark this past season. It was the 15th time this century that a team reached the 100-win milestone. While winning 100 games is a great accomplishment, 100-win teams have not had great success as they entered the post-season. Of the 15 teams that reached 100 wins since 2000, only three (the 2003 Yankees, 2005 Cardinals and 2009 Yankees) went on to play in the World Series that year… and of those three, two won the title (2005 Cards and the 2009 Yanks). But even getting out of the first round of the playoffs has been a chore for the 100-win teams. Of the 12 teams since 2000 that did not reach the World Series, only three made it to their league’s Championship Series meaning that nine of the teams lost in the A.L. Division Series or N.L. Division Series… their first round in the playoffs. Of the 15 times since 2000 that a team won 100 games, four of those times it was the New York Yankees. The Cardinals franchise has done it three times, and the Oakland A’s and Atlanta Braves have each won 100 or more games twice since 2000. Seattle, Philadelphia, San Francisco and the Los Angeles Angels are the other teams to win 100 games in a season since 2000. One other quick stat about these teams that won 100 games from 2000-2014: Of the 14 teams, 11 won fewer games the following year, two won the same number of games, and one actually won more games than the previous year (the Oakland A’s went from 102 wins in 2001 to 103 wins in 2002). On average, a team that won 100 or more games in a season since 2000 had 7.4 fewer wins the following year. Looking back to the start of the World Series in 1903, there have been 82 teams that have won 100 or more games in a year with 28 of those teams making it to the World Series. It’s also interesting to note that the team that holds the MLB record for most wins in a season, the Seattle Mariners with 116 wins in 2001, did not win the World Series that year; the M’s lost in five games to the Yankees in the ALCS that season and never made it to the World Series. Eighteen teams have won 105 or more games in a season in MLB history. Ten won the World Series that year… the last to do so were the Yankees in 1998 when they won the title after winning 114 games that season. Eight teams that won 105 or more games in a season failed to win the World Series in that year; the last team to do so was the 2004 St. Louis Cardinals who won 105 games that year but were swept by the 95-win Boston Red Sox in the World Series.